A few weeks back we shared the distressing news that a Western Australian company was proposing to do Seismic Testing in the middle of whale migration season. Readers have been contacting us just this week marvelling at the amount of whales spotted heading north while out fishing from the shore or swimming or sailing. Advent Energy have now filed with NOPSEMA (via subsidiary Asset Energy). They want to start next month. Under the criteria only stakeholders may approach the company and make them aware their activities may conflict with their own. As part of obtaining permission for activities an Environment Plan must be submitted. That environment plan must contain a report on all consultations between the titleholder and any relevant person including the titleholder’s assessment of the merits of any objection or claim about the adverse impact of each activity to which the plan relates. For the proposed area this would include fishers through fishers organisations, those in charge of marine sanctuaries, or those who conduct marine activities – such as the Whale Data Collection undertaken by local group Living Ocean each Whale Migration Season. Living Ocean have been liaising with Asset Energy regarding the activity so that their raised concerns can be appropriately considered and addressed through the environment plan process. Specifically the organisation has raised concerns regarding the timing of the testing – late August to September 2017 (The survey comprises 46 2D lines of total length 208km. The survey will be conducted in an area of 12.25 square kilometres (km2) plus a single 2D tie line, to the surface location of the exploration well: New Seaclem-1, of ~50km length. Acquisition is likely to commence between late August and early September 2017, subject to receipt of all regulatory approvals. The duration of the survey is conservatively estimated to be between 3 to 4 days) – NOPSEMA/Advent- Asset Energy submission. This is conflict with the southern migration of humpback whales and calves in the operations area. As readily can be verified from any number of reputable sources, the southern migration of humpback whales and calves Megaptera novaeangliae off Sydney and Newcastle takes place from mid August to mid December each year, occupying waters ranging from close inshore to the continental shelf and far beyond. In addition, endangered southern right whales and calves Eubalaena australis occupy this area from May to November. There is a high likelihood of the proposed operations encountering whales of these two species in what is well-established as a biologically important habitat, meaning that the EPBC Act applies. To avoid harm to recovering and endangered populations, seismic operations in this area should not be conducted from May to December (the northern migration of humpbacks beginning in May). Based on Living Ocean’s 12+ years of studying humpback whales at sea and given the elusive nature of the animals the group consider it unlikely that the proposed procedures for whale sighting will result in detection of a significant fraction of whales present in the area, meaning there is a high risk of nearby whales being subject to damage. 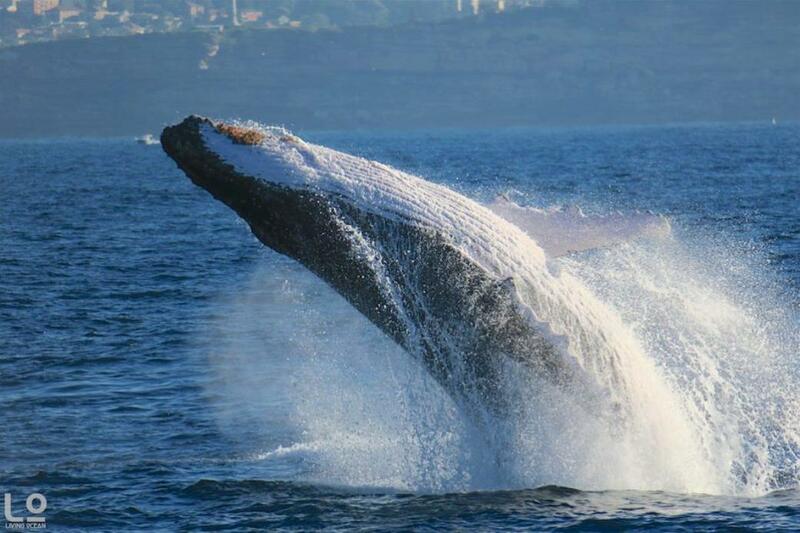 When one humpback is sighted it is likely there are others, unseen, in the vicinity, possibly quite close. The data collectors experience of these groups of whales migrating together points out that such operations should not commence, or continue, if any whale has been sighted in the 3km observation zone. Another point is that at least two observers are required to reliably spot whales. The company’s proposed observation time of 30 minutes would also appear to be insufficient as normally one hour would be required. We're all getting quite used to spectacular photographs of whales breaching, but they don't do this all the way up the coast. Humpback whale dive behaviour consists of a bout of surfacing dives (the short, shallow dives that occur during respiration bouts, usually tens of seconds in duration) followed by a deep dive in which the group disappears for a longer period of time (usually several minutes). A deep dive period is defined as the time from when the last group member disappears to when the first the group member reappears, and the surface interval is usually defined as the time spent on or just under the surface between deep dives, incorporating all brief surfacing dives. Calf blows, being smaller, are harder to spot. The organisation has asked the company to revise its plans taking into account these concerns. As these have only recently been forwarded a reply from Advent/Asset has not been received as yet. This is not open for public consultation - see NOPSEMA information below. ‘Extensive geophysical data have been acquired in the offshore PEP-11 permit over the past 30 years which has demonstrated considerable indications of an active hydrocarbon system. There is a growing body of evidence and papers published on the effect of seismic testing on the animals that reside permanently there or pass through these waters on migrations, such as those undertaken by humpback and southern right whales annually. To conclude, this study found few obvious visible responses of humpback and sperm whales to seismic airgun sound off Angola, while striking short-term and short-range responses for Atlantic spotted dolphins were observed. However, only overt responses were examined, and subtle or longer range responses may not have been detected. For example, bowhead and gray whales exhibited subtle changes in dive pattern and orientation in response to airgun sound (Richardson et al., 1986; Gailey et al., 2007), humpback whales exposed to pressure waves from underwater explosives apparently suffered severe ear injury despite exhibiting no noticeable behavioural reaction to the sound (Todd et al., 1996), and sperm whales may alter foraging behaviour despite a lack of obvious directional avoidance of airgun arrays (P. J. O. Miller, pers. comm.). This work was carried out under the sponsorship of BP Exploration (Angola) Ltd and their partners in Block 31. Results suggested that humpback-whale groups responded by decreasing both dive time and speed of southwards movement though the response magnitude was not found to be related to the proximity of the source vessel, the received level of the air gun, the tow path direction, or the exposure time within the during phase. There was no evidence of orientation of the groups towards, or away from, the source vessel. Funding was provided as part of the Joint Industry Programme on E&P Sound and Marine Life (JIP), managed by the International Association of Oil Dunlop & Gas Producers (IOGP). The principal contributing companies to the programme are BG group, BHP Billiton, Chevron, ConocoPhillips, Eni, ExxonMobil, IAGC, Santos, Statoil, and Woodside. The U.S. Bureau of Ocean Energy Management (BOEM), Origin Energy, Beach Energy, and AWE provided support specifically for the BRAHSS Team, members. An experimental program was run by the Centre for Marine Science and Technology of Curtin University between March 1996 and October 1999 to study the environmental implications of offshore seismic survey noise. This work was initiated and sponsored by the Australian Petroleum Production Exploration Association. The program: characterised air-gun signal measurements; modelled air-gun array sources and horizontal air-gun signal propagation; developed an 'exposure model' to predict the scale of potential biological effects for a given seismic survey over its duration; made observations of humpback whales traversing a 3D seismic survey; carried out experiments of approaching humpback whales with a single operating air-gun; carried out trials with an air-gun approaching a cage containing sea turtles, fishes or squid; and modelled the response of fish hearing systems to air-gun signals. The generalised response of migrating humpback whales to a 3D seismic vessel was to take some avoidance manoeuvre at > 4 km then to allow the seismic vessel to pass no closer than 3 km. Humpback pods containing cows which were involved in resting behaviour in key habitat types, as opposed to migrating animals, were more sensitive and showed an avoidance response estimated at 7-12 km from a large seismic source. Male humpbacks were attracted to a single operating air-gun due to what was believed the similarity of an air-gun signal and a whale breaching event (leaping clear of the water and slamming back in). Based on the response of captive animals in cold water to an approaching single air-gun and scaling these results, indicated sea turtles displayed a general 'alarm' response at an estimated 2 km range from an operating seismic vessel and behaviour indicative of avoidance estimated at 1 km. Similar trials with captive fishes showed a common fish 'alarm' response of swimming faster, swimming to the bottom, tightening school structure, or all three, at an estimated 2-5 km from a seismic source. Modelling the fish ear predicted that at ranges < 2 km from a seismic source the ear would begin a rapid increase in displacement parameters. Captive fish exposed to short range air-gun signals were seen to have some damaged hearing structures, but showed no evidence of increased stress. Captive squid showed a strong startle responses to nearby air-gun start up and evidence that they would significantly alter their behaviour at an estimated 2-5 km from an approaching large seismic source. The effect of underwater anthropogenic sound on marine mammals is of increasing concern. Here we show that humpback whale (Megaptera novaeangliae) song in the Stellwagen Bank National Marine Sanctuary (SBNMS) was reduced, concurrent with transmissions of an Ocean Acoustic Waveguide Remote Sensing (OAWRS) experiment approximately 200 km away. We detected the OAWRS experiment in SBNMS during an 11 day period in autumn 2006. We compared the occurrence of song for 11 days before, during and after the experiment with song over the same 33 calendar days in two later years. Using a quasi-Poisson generalized linear model (GLM), we demonstrate a significant difference in the number of minutes with detected song between periods and years. The lack of humpback whale song during the OAWRS experiment was the most substantial signal in the data. Our findings demonstrate the greatest published distance over which anthropogenic sound has been shown to affect vocalizing baleen whales, and the first time that active acoustic fisheries technology has been shown to have this effect. The last decade has seen an increased awareness of the impacts of anthropogenic underwater noise on marine mammals. Impacts have been described for several different sources, including seismic airguns, underwater explosions, construction and pile driving, acoustic deterrent devices, and scientific and military sonar systems. Possible effects include lethal injuries, short- or long-term hearing damage, and the disruption of normal behavior, including feeding, mating and communication. Disruption of communication behavior may include signal modifications, for example changes to signal duration, frequency or amplitude, as well as changes in signal usage, repetition, or the cessation of signaling. Changes in communication behavior have been demonstrated across several baleen whale species and in response to various noise sources. This study investigates the effect of low-frequency pulses on the occurrence of humpback whale song. The pulses were produced by an Ocean Acoustic Waveguide Remote Sensing (OAWRS) experiment, roughly 200 km from the whales. The mobile OAWRS system was used to image fish shoals over a 100 km diameter area. Male humpback whales (Megaptera novaeangliae) sing long, complex songs on their breeding grounds. In addition, humpback whales have been shown to sing on migration and feeding grounds. On breeding grounds, humpback whales may alter song production in response to boat noise, seismic surveys and military sonar. Most published examples of the effects of non-chronic anthropogenic noise on marine mammals have dealt with sources within kilometers or perhaps tens of kilometers of the study animals. Effects over hundreds of kilometers have seldom been investigated or demonstrated. Arrays of Marine Autonomous Recording Units (MARUs) gathered low-frequency acoustic data within the Stellwagen Bank National Marine Sanctuary (SBNMS) in 2006 and from December 2007–May 2010. In autumn 2006, these recordings happened to coincide with an OAWRS experiment in the Gulf of Maine, approximately 200 km distant. Initial perusal of the 2006 data indicated that (a) a novel anthropogenic sound was detected in SBNMS and (b) that humpback whale song in SBNMS occurred less often, coincident with the sound. Despite having before-during-after data for 2006, we could not make inference on the effect of the OAWRS experiment without appropriate control data. Therefore, we collected recordings from approximately the same place, and at the same time, in 2008 and 2009, two years when an OAWRS experiment was not conducted. Thus, despite having what was initially observational data, we configured a design that allowed us to make planned comparisons from our data. Passive acoustic monitoring was used to document the presence of singing humpback whales off the coast of Northern Angola, and opportunistically test for the effect of seismic survey activity in the vicinity on the number of singing whales. Two Marine Autonomous Recording Units (MARUs) were deployed between March and December 2008 in the offshore environment. Song was first heard in mid June and continued through the remaining duration of the study. Seismic survey activity was heard regularly during two separate periods, consistently throughout July and intermittently in mid-October/November. Numbers of singers were counted during the first ten minutes of every hour for the period from 24 May to 1 December, and Generalized Additive Mixed Models (GAMMs) were used to assess the effect of survey day (seasonality), hour (diel variation), moon phase and received levels of seismic survey pulses (measured from a single pulse during each ten-minute sampled period) on singer number. Application of GAMMs indicated significant seasonal variation, which was the most pronounced effect when assessing the full dataset across the entire season (p<0.001); however seasonality almost entirely dropped out of top-ranked models when applied to a reduced dataset during the July period of seismic survey activity. Diel variation was significant in both the full and reduced datasets (from p<0.01 to p<0.05) and often included in the top-ranked models. The number of singers significantly decreased with increasing received level of seismic survey pulses (fromp<0.01 to p<0.05); this explanatory variable was included among the top ranked models for one MARU in the full dataset and both MARUs in the reduced dataset. This suggests that the breeding display of humpback whales is disrupted by seismic survey activity, and thus merits further attention and study, and potentially conservation action in the case of sensitive breeding populations. Scientists from IMAS and the Centre for Marine Science and Technology (CMST) at Curtin University studied the impact of commercial seismic surveys on zooplankton populations by carrying out tests using seismic air guns in the ocean off Southern Tasmania. Impacts were observed out to the maximum 1.2 kilometre range tested, 100 times greater than the previously assumed impact range of 10 metres, and all larval krill in the range were killed after the air gun's passage. Incidentally, based on the Institute for Marine and Antarctic Studies’s (IMAS’s) research and teaching, the University of Tasmania is ranked fourth in the world for Marine and Freshwater Biology in the latest (2017) CWUR Rankings by Subject. The Whale Protection Act 1980 has now been replaced by the Environment Protection and Biodiversity Conservation Act 1999 (the EPBC Act). The Australian Whale Sanctuary, established under the EPBC Act, includes the entire Commonwealth marine area, beyond the coastal waters of each state and the Northern Territory. Within the Sanctuary it is an offence to kill, capture, injure, harass, chase or herd whales, dolphins and porpoises. The EPBC Act lists humpback whales as vulnerable and state legislation of Victoria, New South Wales and Queensland provides similar protection. ‘A record number of whales have been tallied so far this season, already hitting a total of 3,067! The magic number was hit at Cape Solander - smashing last year's total of 3,033." On Friday, July 7th A mother whale and her new calf were spotted making their way north near Avalon. On Saturday, July 8th, ORCCA reported at midday that Migaloo, that white whale so many have fallen in love with, had been spotted off Port Macquarie – but not before then – despite a distance between Antarctica’s Casey station, located just outside the Antarctic circle, and Sydney itself being 2418 n.m. Updates on the proposed seismic testing will be published when available. More information on NOPSEMA – please visit website for full and more details. NOPSEMA has identified through regulatory research that poor environmental consultation practices in the offshore petroleum industry can lead to negative impacts on individuals, communities, and organisations. It has also received feedback that the current transparency of its decision-making processes and practices is not meeting community expectations. In August 2015 NOPSEMA announced a ‘Stakeholder engagement and transparency’ work program to address these problems. Continued engagement with stakeholders is a vital component of the work program. NOPSEMA is engaging with a range of stakeholders to better understand their views and build support for proposed initiatives. It is NOPSEMA view that this will both improve consultation practices in the offshore petroleum industry and build community confidence in NOPSEMA’s decision-making. NOPSEMA has put in place an Engagement and Communication Plan to best direct its engagement efforts during this time. A Status summary report - Stakeholder engagement and transparency work program(PDF 332KB) has been prepared providing analysis of feedback received by stakeholders and NOPSEMA’s response to this feedback. NOPSEMA is continuing to progress initiatives as part of the work program and has now published its guideline GL1721 - Environment plan decision making - Rev 3 - May 2017(PDF 643KB). This guideline identifies NOPSEMA’s position on key regulatory requirements for consultation and establishes the factors that influence NOPSEMA’s decision-making. A Stakeholder engagement and transparency score card - Q2 2017 (PDF 179KB) has been prepared to track the status of the implementation of the program's initiatives. Often, areas in which oil and gas companies operate will be of interest to many different people with different views on how these areas should be managed. There are circumstances when not all parties will agree with the outcomes of consultation. A company’s environment plan must detail the consultation outcomes including any outstanding issues that may exist. NOPSEMA makes an assessment of this information as well as any other information provided to determine whether impacts and risks to the environment and to stakeholders are acceptable and have been reduced to as low as reasonably practicable. NOPSEMA will make a decision as to whether to accept or refuse to accept an environment plan, based on the merits of the plan and whether all regulatory requirements have been met. NOPSEMA cannot refuse to accept an environment plan on the basis of a difference of opinion between a company and its stakeholders. If NOPSEMA has reviewed the information available and concludes that the information gained through the consultation was provided within the environment plan; that the outcomes of the consultation were addressed within the risk assessment and any measures that the company adopted or did not adopt in response to the consultation were reasonable, then NOPSEMA is likely to determine that consultation was conducted appropriately. On this page, NOPSEMA publishes information regarding the status of environment plan submissions and decisions in order to keep stakeholders up-to-date on the assessment processes. Details of the proposed offshore petroleum or greenhouse gas activity and its location are published on submission of an environment plan to NOPSEMA. From 1 January 2016 NOPSEMA began publishing expected assessment time-frames and decision notices. If an environment plan is accepted, a summary of that plan is also published. Photo by and courtesy Robbi Luscombe Newman - Fantasea Sydney trip one, June 2017. Report by A J Guesdon, 2017.